During CAF LTAR's DataCAFe, Dr. Eric Russell led a discussion on working with data from different sources and ways to avoid issues. He used his experience working with 18 LTAR sites as a way to illustrate his points. His write up is below. Consistent and standardized time format following ISO standard 8601. Data dictionaries for the initial data requests with expected headers and units. With time series data, a big hang-up is formatting time. Time is a problem. Different coding languages and processing programs produce and can handle multiple time formats. However, some formats are easier to handle than others. 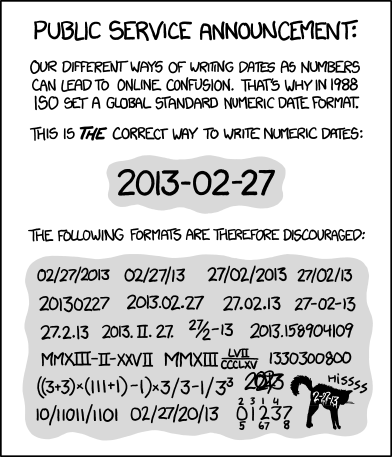 The ISO8601 time standard (e.g., YYYY-MM-DD hh:mm:ss) is a good format since it is a universally recognized standard and avoids confusion of order (Figure 1). When working with multiple data sets with different timestamps, it takes considerable time (and effort) to sort through each file manually to determine how time is labeled and how to convert to a consistent format. The goal is to be able to run data analysis and processing scripts in large batches; not handle each data set individually. Figure 1: XKCD applies to everything. For the headers, converting column names and units is a relatively trivial exercise, except when the headers come with no explanation or units listed. This is where data dictionaries are really handy. The requesting party in theory should include this in their request, either explicitly or implied through asking submissions to follow a particular data format. A data dictionary in its simplest form is a list of the column headers, their units, and a brief (1 sentence) description of the variable (Figure 2). The less time spent manually exploring the collected data-set, the more time can be spent on the data analysis (i.e., the fun part). Everyone has their own lexicon for the different types and sets of data so having a data dictionary for the requested data is important to bridge across different disciplines. Synthesis work takes a number of different people and a high level of coordination but the results are worth the effort. Not everyone has the same experience with different data sets; some disciplines are “forced” into more rigorous data management structures by virtue of the data used but everyone can benefit from even simple data management systems. Eric Russell is a associate research professor with the Laboratory for Atmospheric Research at Washington State University working with the eddy covariance flux tower and PhenoCam data.